Blueberry season is just about here. This is a tried and true recipe our guests love. 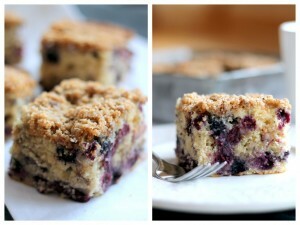 Light, fluffy coffee cake with fresh blueberries and a sweet, crunchy topping. Preheat oven to 350 degrees. Grease a 9-inch baking pan. In large bowl whisk oil, sugar, egg, vanilla and milk until well combined. Sift together flour, baking powder and salt. Add to the above mixture and stir with wooden spoon just until combined. Don’t over mix. With a rubber spatula, gently fold in the blueberries—don’t over mix. Transfer cake batter to prepared baking dish. In a medium bowl, combine and mix gently all ingredients EXCEPT melted butter for STREUSEL topping. Add melted butter to topping mixture and stir to combine. Sprinkle on top of cake batter. Bake for 30-35 minutes. The cake will puff up and brown around the edges. Check with toothpick for doneness. This entry was posted in B and B recipes, bed and breakfast, breakfast, C.W. Worth House by Margi Erickson. Bookmark the permalink.